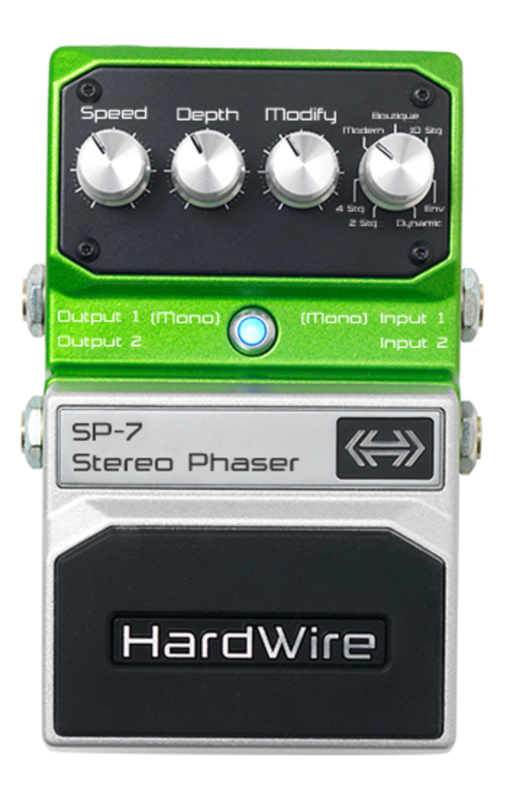 HardWire®, a leading manufacturer of guitar pedals, today introduced the SP-7 Stereo Phaser Effects Pedal. The SP-7 is an advanced Phaser effects pedal offering seven Phaser types based on popular new and vintage effects pedals including 2 stage, 4 stage, modern, boutique, 10 stage, envelope, and dynamic. Leveraging DSP originally developed for the DigiTech RP Series of products, the new pedal also features controls for speed, depth, modify, and phaser type, as well as an indicator LED and tap tempo switch for setting the phaser's effects modulation speed time during a live performance. The SP-7 also includes HardWire's trademark extreme performance features like true bypass and high-voltage rails. It also features true stereo I/O, allowing for complex connections and sounds with extreme flexibility. "We are committed to expanding the HardWire line of pedals to provide guitarists with the most comprehensive set of effects available anywhere. The SP-7 Stereo Phaser offers the ultimate combination of new and vintage phaser effects at lowest price," stated Rob Urry, president, Harman Music Group. Each HardWire pedal also features an assortment of tour-worthy accessories, including green gaffer tape common to pro pedalboards, Stomplock™ knob guards to maintain pedal settings and a hook and loop pad to fasten the pedal to a pedalboard. The SP-7 will be available in February 2011 with an MSRP of $189.95.